Tyler Land, son of Gordan and Debra Land. 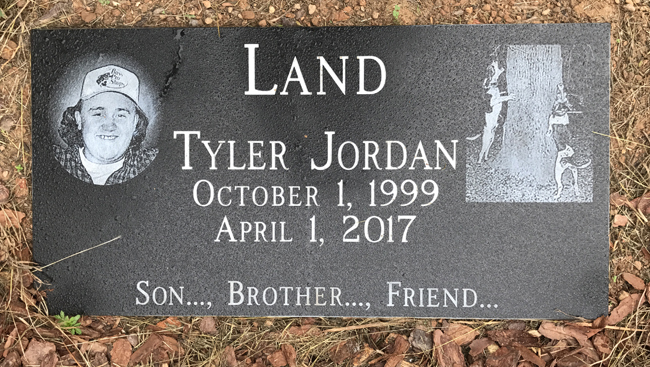 Tyler Jordan Land, age 17 of Canton, passed away on Saturday, April 1, 2017. The family will receive friends at Darby Funeral Home on Wednesday, April 5, 2017 from 2:00p.m. to 9:00p.m. Funeral services are scheduled for Thursday, April 6, 2017 at 12:00p.m. at Birmingham United Methodist Church with Rev. Steve Owen and Apostle Curtis Williams officiating. Father and Mother - Gordan and Debra Land of Canton. Sister - Erica Land of Canton. Grandfather - Donald Land of Duluth. Grandfather - John Summerour of Marietta.